While our UPLIFT desk frames can support any desktop that is a minimum 22.75" deep, the standard desk foot is over 27" deep, meaning that the feet may protrude on more compact desktops. If you plan on moving your UPLIFT adjustable height desk T-frame base to a smaller top, these 24" feet are ideal for you. If you need a standard foot, see the UPLIFT Desk Standard Foot for T-frame Desks listing. Short feet are sold individually. Why do I need a short foot for my adjustable height desk? 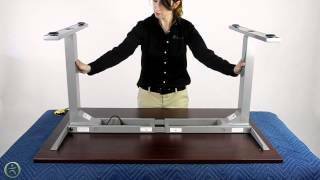 UPLIFT Desks mount to desktops at least 22.75 inches deep. The standard foot on our frames is over 27 inches deep, so the feet may protrude on shallower desktops. If you plan to switch out your desktop for a smaller one, these 24 inch feet will keep your desk's feet in proportion. What type of frame will this work with? Our Short Foot for T-frame Desks was designed to fit with the frame on our T-Frames. Check out our listing for Short Foot for C-Frame Desks if you need ones that work for your C-Frame desk setup. My desk is only 20 inches deep. Will this work for me? Unfortunately not, your desk must be at least 22.75 inches deep for our UPLIFT T-Frames.